Gateway Natural Area is tucked away 15 miles west of Fort Collins along Highway 14 where the North Fork of the Poudre joins the main branch of the river. The park was Fort Collins' first mountain open space and originally the site of the water filtration plant for the city that opened in 1903. It reopened to the public in 2002. The park sits in a peaceful valley below and away from the road noise. Although Gateway is locally known as a top-notch family destination with easy-going trails and great scenery, there are still plenty of opportunities for the adventurous type. When you arrive at Gateway Natural Area you can avoid the five-dollar parking fee by parking at the top of the road just before Highway 14 turns sharply to the left. Once you get down into the park, you enter one of the most well maintained picnic areas in the region. With the Poudre River running along the east side of the park it serves as a popular launching point for kayakers and tubers. I’ve definitely spent my fair share of time floating this stretch and it’s a really enjoyable experience. Once you cross the river you enter a wide trail that transports you into Roosevelt National Forest and continues for 1 mile to the base of Seaman Reservoir. The ¾ mile Black Powder and ¼ mile long Overlook Trails branch off the main route and provide interesting viewpoints of the devastation from the Picnic Rock (2004) and High Park Fires (2013). You eventually cross the river again before making the final steep climb to the reservoir, where you're greeted with awesome views and the opportunity to continue hiking. It’s a dwindling secret that Seaman Reservoir contains some of the best cliff jumping opportunities in the state and if your feeling adventurous continue hiking up the trail to your left at the top of the dam. The trail zigzags along the hills at the western most point of the reservoir and eventually arrives at a secluded location along the back edge of the lake. Along the trail you cross through the edge of the Hewlett Burn Area. This area was scorched pretty badly last summer and although you can’t replace the Ponderosa habitat, the vegetation has recovered substantially. Seaman Reservoir serves as an important water source for the City of Greeley and the fire last summer unfortunately forced a lot of debris into the lake. After a mile of steep ups and downs, you reach a ridge where you can launch yourself off the jagged row of cliffs from June-August depending on the water level. Ranging in size from 8-30 feet, these cliffs should be approached with caution and it’s never a bad idea to check the depth before you jump. With the typically large crowds that come up here every day of the summer, you are sure to solicit a few hollers when you gracefully fly off the rocks. If you have the time and an adventurous spirit, continue northwest down the trail where you might even find a rope swing tied to a large tree along the bank. I wouldn’t recommend attempting this unless the water is really high and you are confident in your rock scrambling ability as the trail becomes less defined the further north you go. I find Gateway to be one of the most pleasant, accessible and well maintained Natural Areas in Larimer County. It’s a quick 20-minute drive from Fort Collins and definitely holds its fair share of local secrets. Check out the video below for a little taste of what Gateway Natural Area and Seaman Reservoir have to offer. 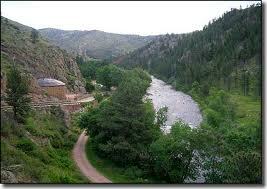 Directions: Gateway Natural Area is located at 5216 Poudre Canyon Highway (Hwy 14). Take Highway 287 to Highway 14 West, then travel 5.2 miles on Hwy 14 West. Gateway Natural Area is on the right side of the road. "Up we climb with glad exhilaration." Looking up Gateway from Highway 14.